Spartacus looks great 612. I think he will do fine if you can get some shows with decent entries. It will be tough to get him wins over Brutus if its only the 2 of them as CH dogs will tend to get the win in the BOB competitions. 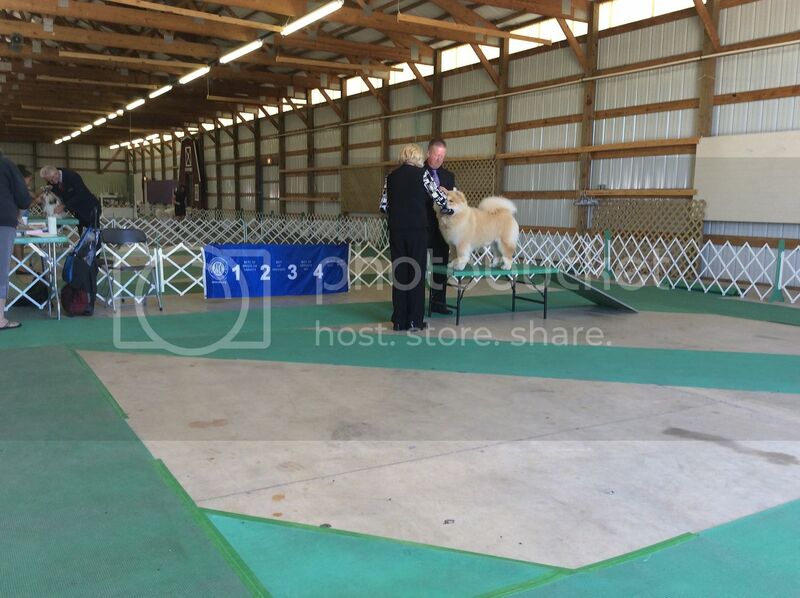 Judges are hard pressed to award wins out of the classes over a CH unless its really a runaway. 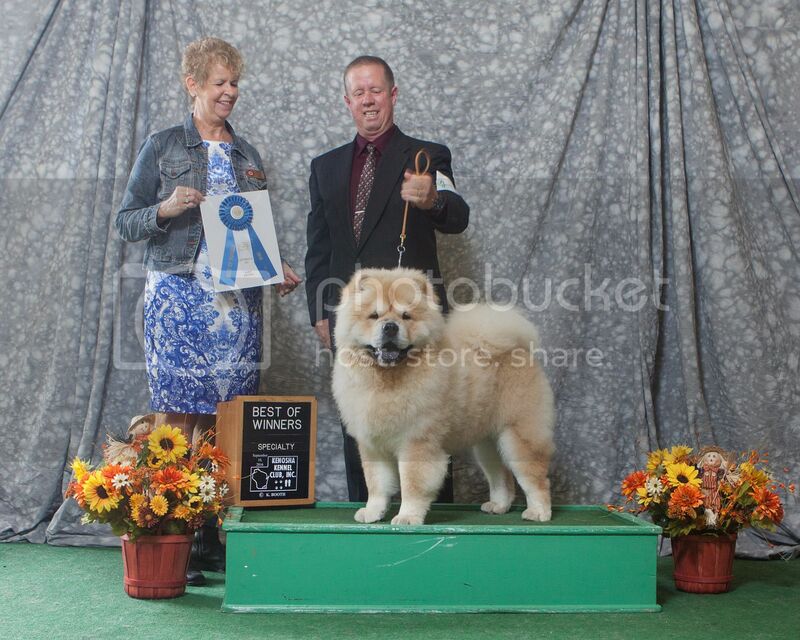 We traveled to Wisconsin last weekend and Spartacus earned his first point toward his AKC Championship. We have a lot of things we can do better but it's a process. He still has almost all his puppy fur but everyone loved him. 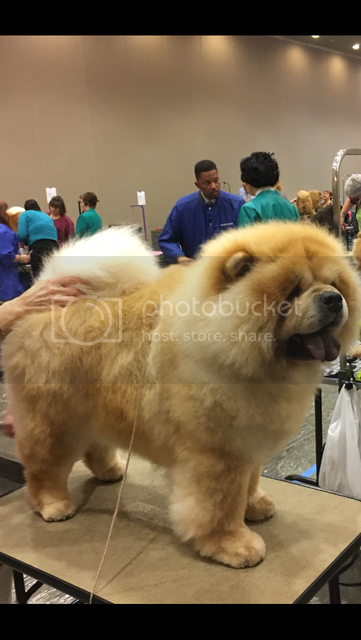 There were 7 other chows at the show but none in his class, 9 to 12 months puppy. Congratulations on his first point! He looks fantastic. I am concerned that it will take us a fortune to champion our new puppy. 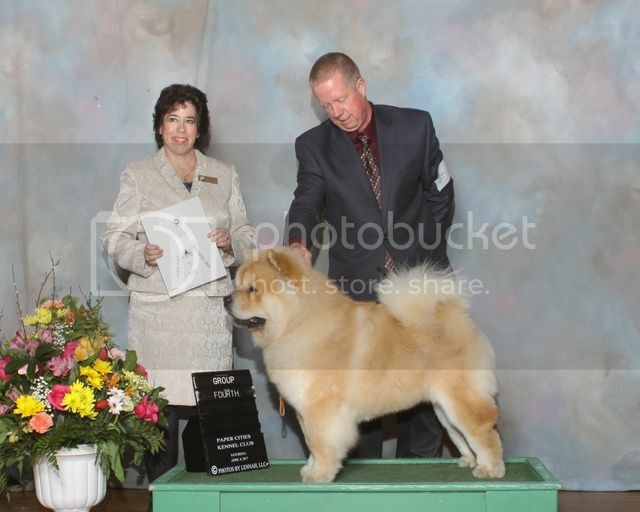 This last year I showed Chance in 8 shows and he was the ONLY chow. No points at all towards his GCH this year. I am making a list of large shows around the US. We will have to do a lot of travelling to earn points. Not a lot going on in Texas. I forgot to ask... How much does he weigh now? Spartacus is hanging around 70lbs which I'm actually happy with. He should grow another inch taller and will fill out in the next 6 months according to his breeder. Finding chows to compete against is our problem too. You could always have your breeder show your new pup and would probably be cheaper and a lot less time. We will be going to Nationals next year which is during the week with all breed shows on the weekends before and after near there. Also checking out other chow specialties for possible majors. 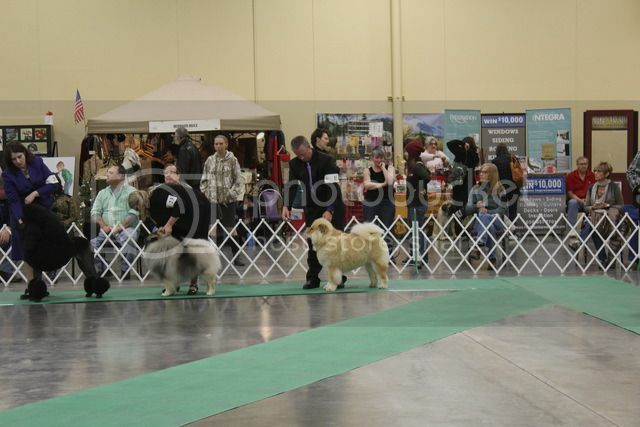 Chance is an inch or two taller than most of the chows in the ring. He is 75lbs and I personally love his build. He moves very well. It sounds like Spartacus might be close to the same size. I told my breeder that I want to finish this pup as well. I know they would help me but I love the bonding time I have had with Chance. Nationals would be awesome, but just too far of a drive. If it is in TN again in 2018 we will try to go. I am checking out chow specialties. I can totally understand showing your pup yourself and wouldn't think of doing it any other way. I too like chows with longer legs that can move but can see why others like the other types too. Yes, they seem very similar and hope someday to meet you and your chows. I measured Spartacus and he's 20 inches tall but seems bigger because he has a longer neck and a big chest. Congrats on doing so well with Chance in NOHS this year, we will be entering Spartacus in it now and hope to get ranked in top 10 next year. I know people that enter 2 shows on the same weekend so they have a better chance to find chows to compete against. I can't see myself doing that now but in the future I could. Here is the win photo from our last show. Spartacus is 11 months old and still has his puppy coat. Hopefully more wins to come. He looks GREAT! I am really impressed with how he is coming along! Thanks for the comments on the NOHS. Chance will probably get bumped out of the top 10 because I have not showed him in an OH show in months and don't have any shows with him planned until late October. I think Spartacus will jump up the charts in the NOHS. I cannot wait to see him when he matures. Everyone looks great...nice Win photo with Spartacus. I tried to post on this last week but had trouble with the site...all my typing was slow and every backspace took a minute or two, so I shut it down in frustration. Nicely done on NOHS to both of you, I stopped just because of the time requirement. After breeds I just want to pack up and get on the road. NOHS requires me to hang at the show site until after Groups and I just had trouble committing the time vs reward. Getting the entries to compete against is definitely a problem. I used to complain about it all the time. Thought I found that solution after Toby finished his CH...Wrong...Rory now has 22 GCH points and only needs 2 majors to finish GCH, so I started downplaying him when the entries weren't enough to get the major. He still kept getting Select and taking the points away from Toby. I even stopped grooming him before shows and even put my wife on him last time out...no luck even though it was her 1st time showing and had trouble lining up in number order for BOB. I was looking at GCH Rankings and saw Brutus was just a point behind Rory for the year. Well Done. And don't downplay the point in Wisconsin. That had some decent entries, so that was a nice win. I think we will just be entering Toby for the next few shows. We will need 6 males to get the major for a Select placement, and that's just not happening right now. Not sure whats favorable to specialties for the rest of this year. We had one last year in West Springfield, MA but I don't like this years judges so I wont be entering. 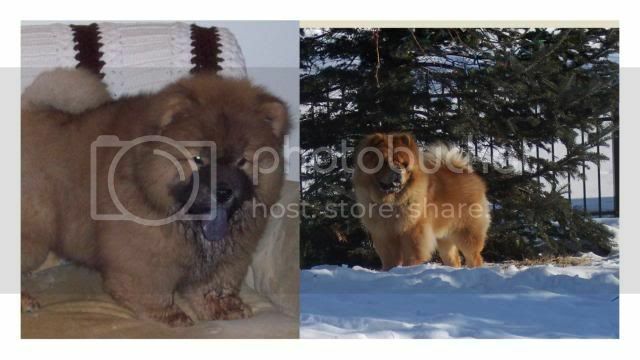 19 Chows entered for last year, which is great but I don't see that happening again. Time is going fast. We have been going to conformation classes and a couple shows lately to get Spartacus more relaxed at the shows. He got a group 4 placement in OH two weekends ago over GCH dogs. Last weekend nothing but now he is comfortable walking in big crowds and will let the judge inspect him without backing away. He is now 13 months old and I hope his adult coat comes in soon. Still at 18 months old he still doesn't have his adult coat. Been told it will take up to his second birthday. We were at shows last weekend and he beat a GCh for breed and then took a Group 4 in the Non- Sporting Group. Our very first one. Here is our picture, it would of been better if his back legs were straight down. Spartacus looks amazing! A huge congrats on all of the hard work and your continued success! Go team Spartacus! Thanks Cindy, he's still a butthead at times but a sweet heart most the time. We my slow down some until he is 2 so his adult fur will be all in and he will be fully mature. Then he will be ready to compete against CH and GCH to get his CH. 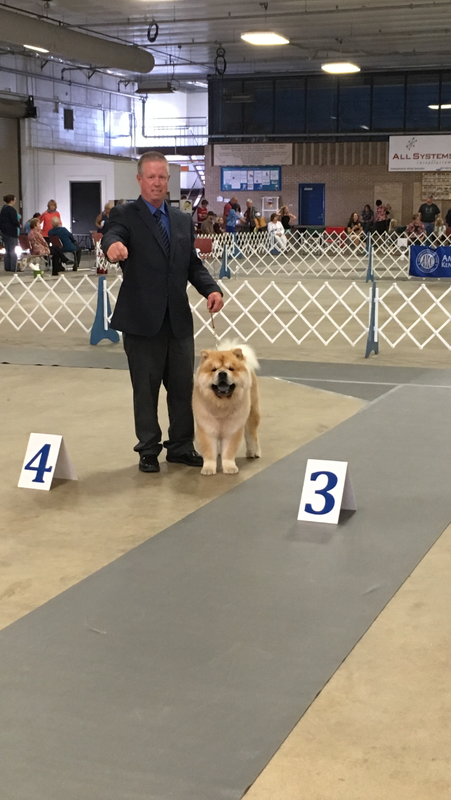 We are in no hurry .The last show from the previous post he won over a Chow that won Nationals 3 years ago and was Best Of Breed at Westminster. Also the 3rd or 4th best in the country the last 3 years. Here is a picture of his dads brother from the same litter that we got to see at a show recently. Had a memorable weekend at a show. It was our first time camping with our RV and it went really well. 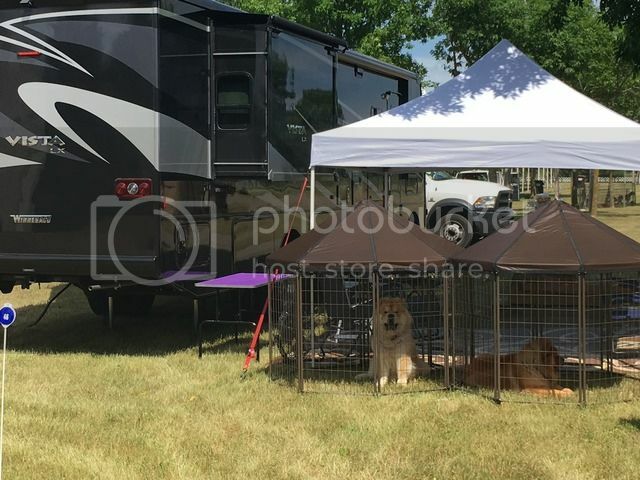 Our friends camped next to us with their 3 chows made it really special. Love the camper. That is next on our list. Happens to be the retirement plan. Grab the dogs and just Show the entire East Coast. I sent the photo to the wife and she is ready to go shopping. Argh.... Photobucket decided to pull the plug on free photo hosting. It took me forever to figure out how to post pics of our new puppy. Been a busy summer to try to figure how to post pictures. Maybe you could point me in the right direction. Ok, I did it. Our last show. Oh My Goodness, you two look amazing! An older picture but one I like. 612guy wrote: An older picture but one I like. He looks majestic. Awesome pic!